Today, I’m happy to turn over my blog to a guest, author Sandra Sookoo. Sandra has a new book out that is a really fascinating new take on something very old – Fairy Tales. We’re not talking about anything as mundane as modern fairy tales, though. We’re talking about re-imagined fairy tales with a Science Fiction twist. 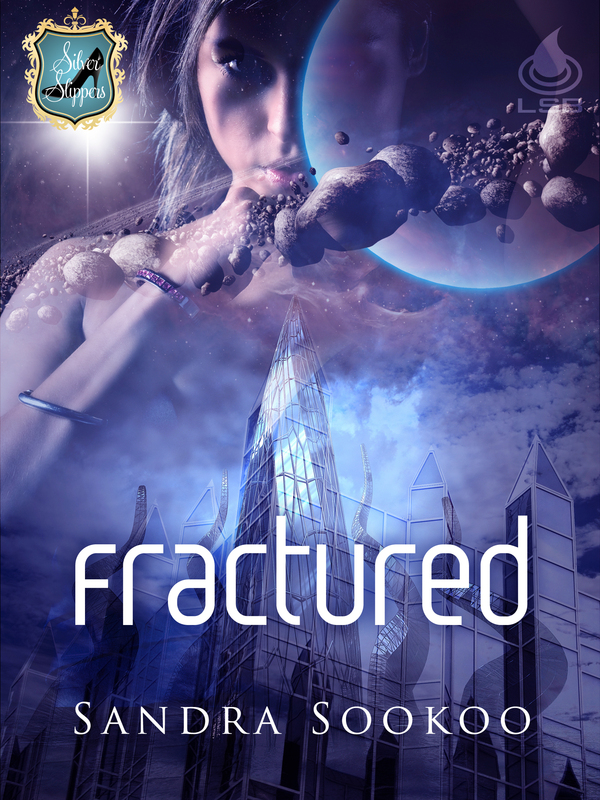 That’s just what FRACTURED is all about. So here to tell us all about her new book, and the giveaway that she’s planned, is author Sandra Sookoo. When Liquid Silver Books announced their Silver Slippers call for reworked fairy tales, I was in the seventh heaven of delight. Can you imagine? My very own chance to put a stamp on the fairy tale world? To have the opportunity to shake up beloved tales in my own way? I couldn’t wait to get started. I’d already had a reimagined fairy tale (which came out last December) call Wishful Thinking hit the virtual shelves, but I needed more. But wait… I wanted a different spin on things. I didn’t want the same old blah, blah, blah. So I plotted and planned. I thought putting a sci-fi edge on the story would be good and making the heroine a blood-sucking alien would be even better. Oh, the hurdles my hero and heroine would need to overcome. Then I was surprised by my editor during edits when she mentioned the fairy tale she thought I’d re-imagined. I had no conscious knowledge of that, but looking back, I can totally see it. I mashed together two fairy tales into this retelling. I guess that’s what happens when I have fairy tales in my blood. What’s the second one you ask? Ah, you’ll need to pick up a copy of the book and see if you can tell! You can almost hear the wicked laughter in the background, huh? I had the greatest fun writing FRACTURED. Here’s the blurb: What happens when beauty is the beast? Major Rick Keenan has a near-impossible mission: repair his broken shuttle, rescue a missing crew member and get off an almost-dead planet. Angry that the U.S. is discontinuing the space program, he wants to find a discovery that will revise the government’s position. Unfortunately, that discovery might just kill him. Marin is one of the last of her people. Forced to flee to the planet in her childhood, she’s kept herself hidden away in darkness, safe in a castle-like fortress, only coming out when she needs to feed–from human blood. Convinced she’ll never fit in, she shuns all contact, yet taking Rick hostage as a food source chips away at her perceptions. Now for a short excerpt. In this snippet, the hero Rick and his teammate have just encountered a welcoming party from the planet they’ve landed on. “I am Sharn. This is my daughter, Elisa. Welcome to Oolita, the village of the damned.” The man rubbed a shaking hand along his forehead. “Damned?” Rick narrowed his eyes. “How do you figure?” He made another sweep of the medieval-style village and assessed his hosts’ period clothing. This planet’s not as advanced as Earth. Fantastic. Won’t be able to grab some guys from the village to help with repairs. “Maybe they found a new hunting ground.” Reigen shifted his weight from foot to foot. Giveaway: One random commenter will receive book swag (bookmarks, postcards, etc) plus a cute little fairy tale themed necklace. This giveaway is open to US residents and Canada only. Please leave your contact information. Winner will be drawn January 25th. My pleasure! I love the world you’ve created in FRACTURED. Thanks JC 🙂 The story really came out nicely. Wow, Sandra, wow! It sounds like a great story. Could the second fairy tale be Rapunzel?? I love fairy tales! Hi Jennifer! Nope, the 2nd fairy tale isn’t Rapunzel 🙂 It’s the Ugly Duckling. Oh I can’t wait to read this one Sandra! I love fairy tales! Thanks for stopping by Candace! Randomly drawn winner is Jennifer Johnson. Please email me your mailing address at sandra (dot) sookoo (at) comcast (dot) net.